My daughter Iris’s favourite dinosaur is an Ornithochyrus as the ending sounds like her name. When she asked for it in cake form for her 4th party, I started to sweat! I like a challenge, but…! I asked my sister for tips and her tip was “Convince her she wants a different cake!”. In the end I made a simple rectangle birthday cake, drew an Ornithochyrus on paper and used the paper as a stencil. 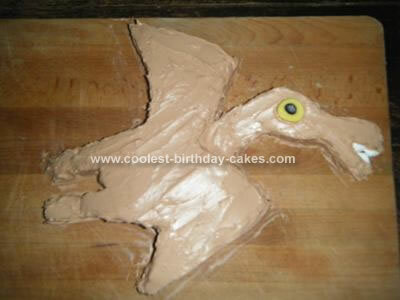 I layed it on the cake and cut around the paper with a bread knife. I decorated it with brown icing (white Betty Crocker), red, blue and yellow natural food colouring. The eye of the homemade Ornithochyrus cake is a licorice all sort and teeth are mini marshmallows cut in half diagonally. Luckily, Iris was very pleased!